Here’s a fencing contractor who went all out to get the job done – he even hugged a turkey! My little menagerie of pets needed a new fence. He was available for fence installation in my area. I can’t say enough good things. Everyone who comes over comments on the fence and how beautifully done it is. I’ve already raved about him to my friends and as a result, they’ve been asking him to do jobs as well. What prompted me to look for a fencing contractor was an incident with the previous fence, my DIY concoction. This spring my niece and her husband were over visiting …when all of a sudden he looks up and says, “Are those sheep in your woods?” I go, “Oh my gosh, yes!” Well, the grass always looks greener on the other side, so my sheep had decided to make a break for it. That’s when I decided to invest in having a professional replace the fencing. How I got hooked up to the contractor I used, Jesse of Day and Night Restoration and Remodeling, was by simply typing “fencing contractors near Dousman Wisconsin” in my computer’s Google space. When I called the 800 number that came up, I was matched to my contractor by area code. The very next day Jesse came over to take a look at what I needed. I can’t say enough good things about him. We set an appointment for 8:00 am and bango! He was there at 8:00, almost like he waited down the road to pull in at exactly the right time. He came back the second day to take measurements and discuss the kind of fencing I wanted. He worked with me deciding what type of fencing would be best to keep my little critters in. We looked together online to see what was available in the local farm supply stores and found 4” round fence posts on sale, so we went with that. He dug holes to install cement footings so they would be sturdy. We bought heavy-gauge 16’ cattle panels (which also happened to be on sale) too, thinking they’d be sturdy enough even for my goats, who love rubbing and scratching on the fence. When he mounted the panels, he had the idea to push the lower edge into the ground so the larger animals couldn’t escape. For the chickens and ducks, we had to add wire on the bottom as well. Jesse made a particularly useful suggestion that kept the animals enclosed while he was working: put the new fencing up on the outer perimeter of my existing fence and take the old fence down only when the new one was complete. That just worked out perfectly. One thing Jesse had to get used to was keeping his cool while working with my animals in the background. 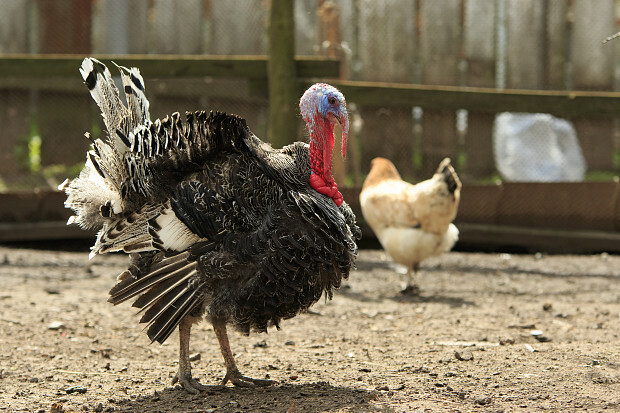 My male turkey, Cool Hand Luke, followed him all around, gobbling and strutting his stuff. One time, while we were sitting wiring the bottom part of the fence by hand, Cool Hand Luke starts walking up to Jesse sideways. Jesse’s wondering, “What’s this turkey going to do to me?” when all of a sudden, just like a teenage boy at a movie with a girl, Cool Hand Luke puts his wing around Jesse. Jesse wasn’t sure whether to panic, but then the turkey puts his other wing around him and ends up sitting in my contractor’s lap. Aww! Now those two are just the best of buddies. He was very obliging; he came up with excellent ideas to accommodate the animals and make things convenient for me even though he had never done anything quite like my projects. When my chiropractor was getting rid of his son’s jungle gym, Jesse and his helper picked it up and reassembled it in the yard for my goats to play on. I didn’t want it put back together exactly the way like it was before, because it had been really high with ladders and slides – too dangerous for my goats. It was totally Jesse’s idea how to adapt it – adjusting the height, adding a ramp, and so on. What were his outstanding qualities as a contractor? First of all – promptness. Second -- his determination to make this as cost-efficient as possible. Accuracy and quality -- everything was perfectly done. Timeliness -- the whole fencing unit was completed within 2 weeks and it was quite a large project. What advice would you give to other homeowners based on your experience? Make sure you know what you need from your fence – for instance, whether it’s to be decorative or to keep in unruly sheep and goats. And if your situation is a little unusual, hire a contractor who’s ready to be flexible and creative … like mine! New Cedar Fence Lets Our Dog Get his Exercise by Lori G.
Cast Iron Bathtub Replacement Was Definitely Not A DIY Project by Laura M.
Concrete Repair That Was Literally The Answer To My Prayers by Brenda G.